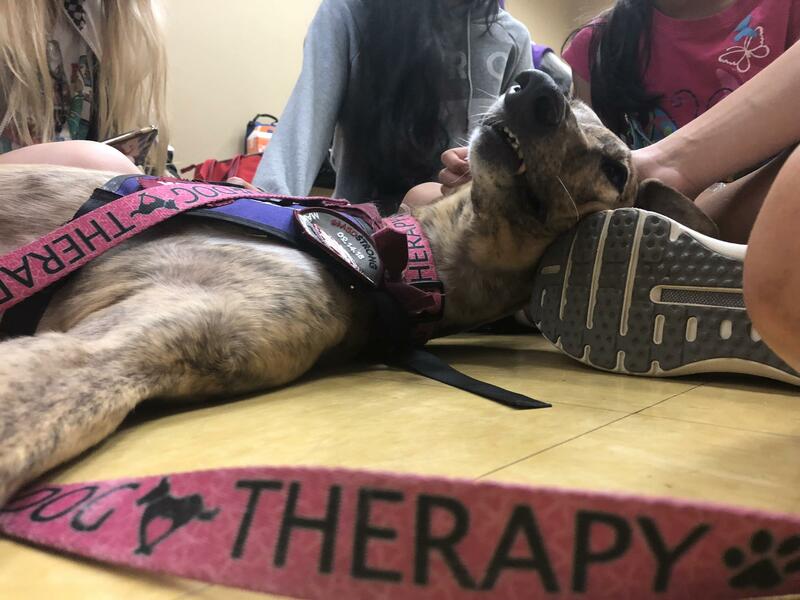 Lulu, a three-legged greyhound, lays on the floor at the Parkland rec center during a Therapy Dog Thursday event this summer, surrounded by Marjory Stoneman Douglas High School students. 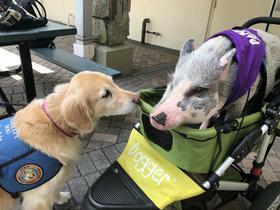 Therapy dog Sophie greets therapy pig Patches outside the Parkland rec center before a Therapy Dog Thursday event. Patches' owner, Tiffany Aaron (far right), looks on. Her daughter, Emily Aaron, 15, is in the background with her therapy dog, Lulu. 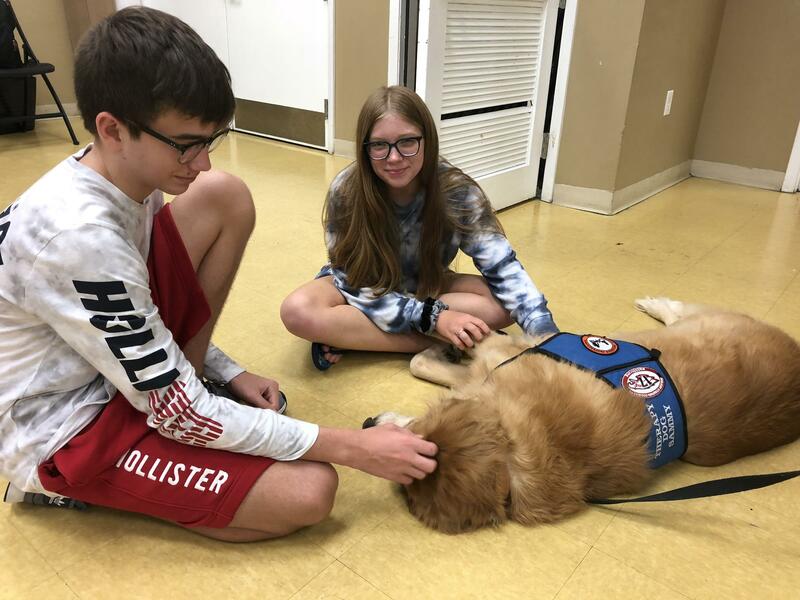 Therapy dog Sophie rests her head on the hand of a recent Marjory Stoneman Douglas High School graduate during a Therapy Dog Thursday event over the summer. Golden retreiver Shelby and golden doodle Jesse have helped sooth feelings of anxiety and panic for student survivors of the Feb. 14 shooting. 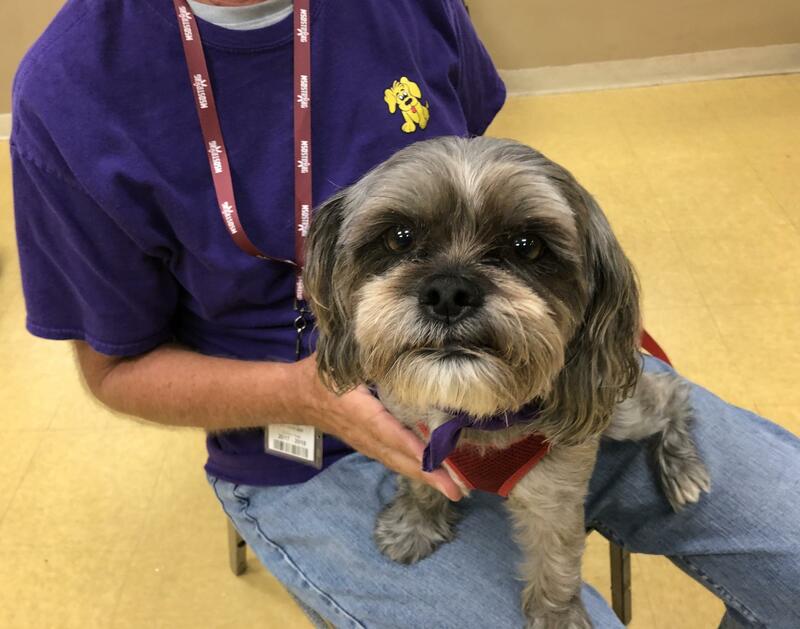 Therapy dogs are back at Douglas this school year. Therapy dog Annie, a mix between a Yorkie and a Shih Tzu, is one of the reasons many Douglas students felt they could return to school after the Feb. 14 shooting. Siblings William and Elizabeth Olson pet therapy dog Sammy. William, 15, is a sophomore at Douglas and was shot at school on Feb. 14. Dogs like Sammy have helped him feel calm and safe in school since. 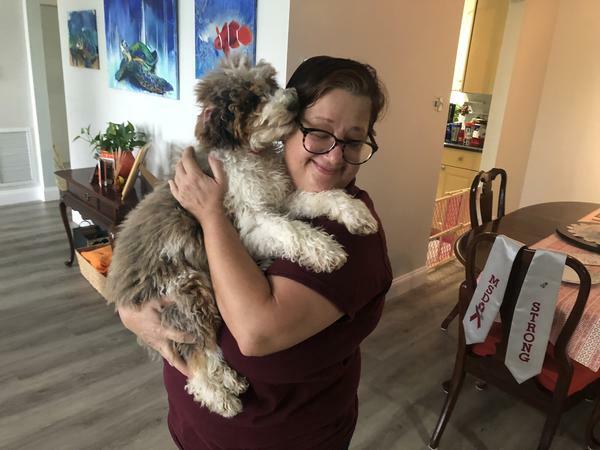 Marjory Stoneman Douglas High School library media specialist Diana Haneski holds River, her new bernedoodle puppy, at her home in Margate. 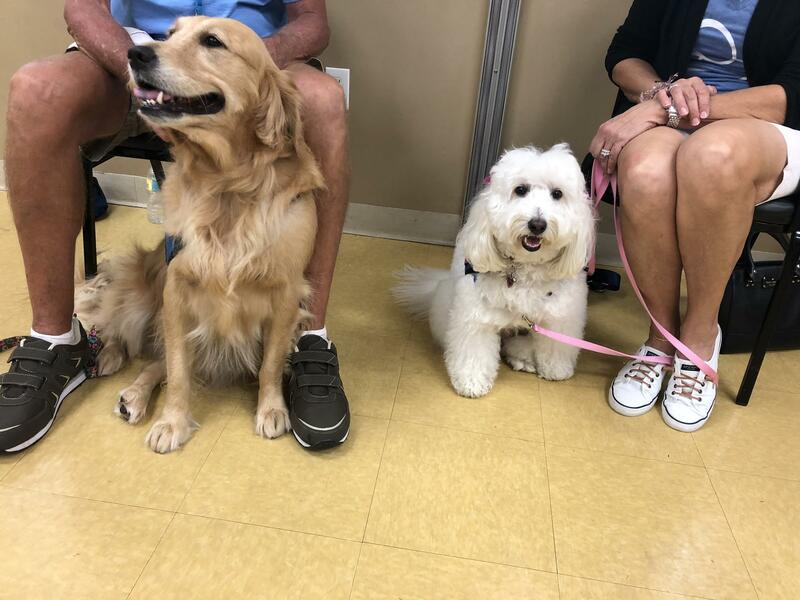 River is a therapy-dog-in-training, and Haneski is bringing her to school every day. River, the Douglas library's own therapy dog, is a cross between a Bernese mountain dog and a poodle and was donated by a breeder in Idaho. When William Olson had a dog next to him in class, he got through the school day. When he didn't, he often went home early. 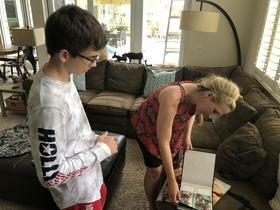 "Just knowing it's there, that I can pet it — it helps me remember that I'm at school and I'm safe," he said one July afternoon, as we sat with his mom in the living room of their Parkland home. 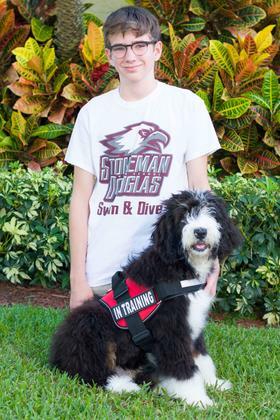 The 15-year-old is now a sophomore at Marjory Stoneman Douglas High School. Since Feb. 14, he has carried a partial bullet in his left arm. Doctors don't want to remove it for fear of causing nerve damage in his fingers. And there's shrapnel in his other arm. Three students died in his classroom that day. William is a quiet kid. His mom, Lisa Olson, said he was shy even before the shooting — during which he and 16 others were injured, and 17 people were killed. But the teen lights up when he talks about the therapy dogs who helped him and his peers deal with anxious and panicked feelings after their trauma. "There's this one dog, Sophie, and she's very food-motivated. If there's food, she'll do anything for it," William said, smiling as he recounted each of the pets he spent time with last school year. "Then there's Sammy. … He's one of my favorite ones, because he's really calm and relaxed. Then there is Fergie. … She has really puffy hair and makes really funny facial expressions when you're petting her." Therapy dogs from all over the country were waiting for Douglas students when they returned to school after the shooting in late February. Many students, parents and teachers said the animals made going back bearable. In anecdote after anecdote, they described situations when an animal could sense someone was struggling and provided comfort subtly and gently, like by resting a head or paw on the person. The animals are trained to stay calm and quiet, no matter the situation. 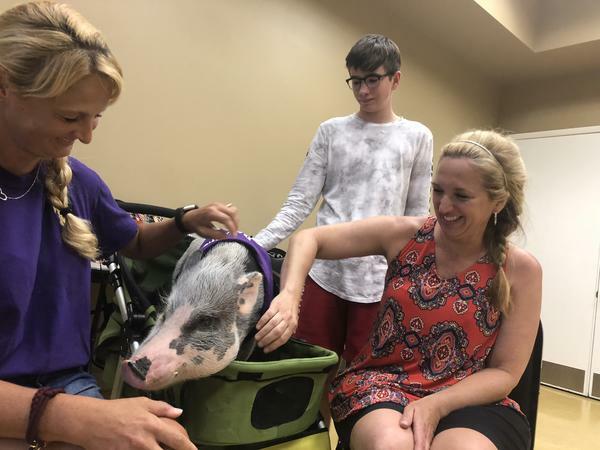 Local volunteers continued to bring their dogs — and even one pig — to the school throughout the rest of the year. Now, they're back by popular demand. "I would love for William not to need this," his mom said. "William was …," she trailed off, took a breath. "We were all different before February 14th." The Olson family was deeply affected by the shooting, not just because of William's injury. Lisa works at Park Trails Elementary, a Broward County public school down the street from Douglas. Her husband, Richard, is a detective with the Broward Sheriff's Office, the agency that responded to the incident. And their daughter, Elizabeth, is an eighth grader at Westglades middle, which is next door to her brother's school. "I never thought William would need a dog at school. It's hard to even say that," Lisa said. "But it's such a benefit for him. It has been a special gift." William Olson has some unusual mementos from his freshman year of high school: a handful of what look like baseball cards, but instead of players, the pictures are of therapy dogs. He has a photo blown up on a big canvas and an album full of pictures, too, showing him in class with one of his favorites: Sammy, a 9-and-a-half-year-old golden retriever. 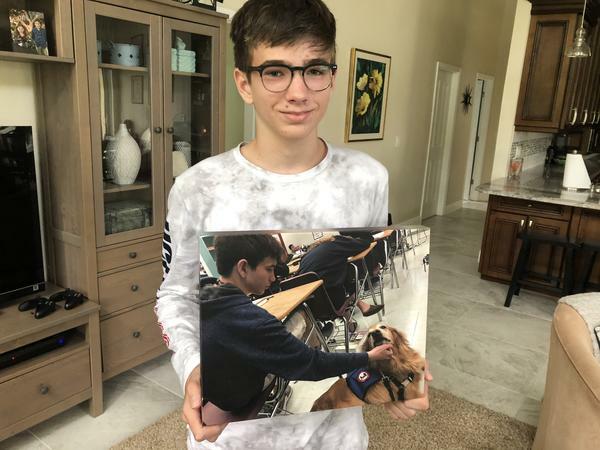 "This was in AP Human Geography class," William said, showing me the photos taken by the dog's owner, Debbie Beaudin, and given to him as a gift. "This was one of the first times I met Sammy. Because, in this picture, he didn't have a haircut, and now he has shorter hair." The pictures show William sitting at his desk, working on an assignment, while Sammy sits or lays next to him on the floor. In some, William is leaning over to pet Sammy or cradling the dog's paw in one hand while holding a book he's reading with the other. "Sometimes, if I was feeling uncomfortable, he would just put his paw on my shin," William said. "It really helped. I would remember that he was there, so I could pet him." Lisa Olson said she's grateful for the photos, because they allow her to see what it was like for her son at school after the shooting. 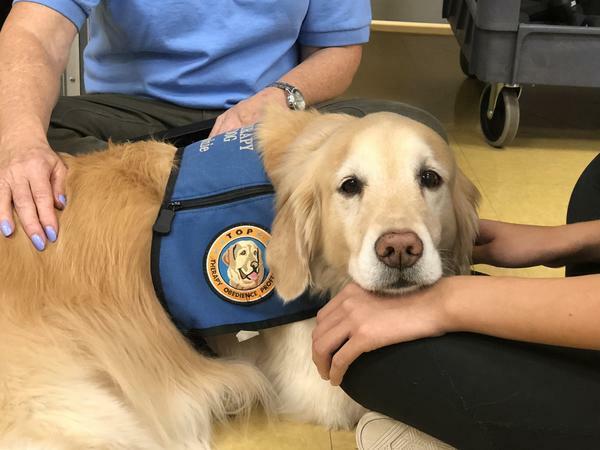 She said the relief provided from therapy dogs was more effective and immediate for William than the strategies offered by traditional talk therapists. "It's very hard for a child to visualize that they're at the beach, put their bad feelings in a container and deal with them later, or do some meditation," she said. "The dog is such an easy way for William … to feel that release." Debbie Beaudin, Sammy's owner, is paralyzed and uses a wheelchair. She originally got Sammy as a service dog for herself. She and the Olsons say they've developed a lifelong friendship. Volunteering at the school "has done something to my soul that is so hard to put into words," Beaudin said, adding she plans to continue as long as she can. "I would like to go until William graduates and even beyond," she said. William now has the comfort of a therapy dog at home as well as in school. He recently got Skipper, who was donated from a breeder near Orlando called Highfalutin Furry Babies. 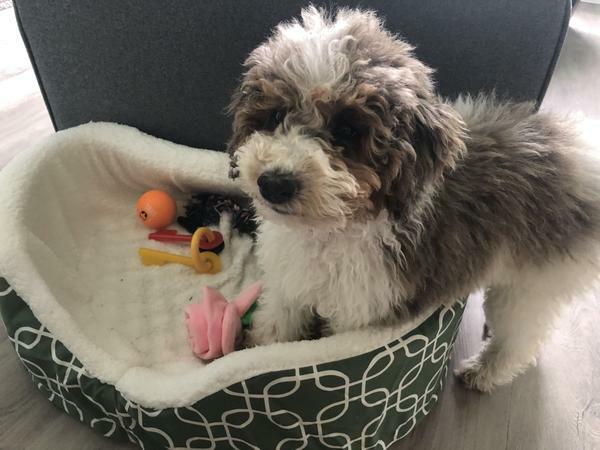 Eventually, he hopes to bring Skipper — a bernedoodle, which is a cross between a Bernese Mountain Dog and a poodle — to an assisted-living facility, so he can share the dog with others in need. And William wants to get a card made for Skipper, too, with a picture and a fun fact about him. Here's one the family has discovered so far: the fluffy dog's trips to the groomer cost more than Lisa's haircuts at a salon. Therapy Dog Thursdays were the highlight of the Olsons' summer. 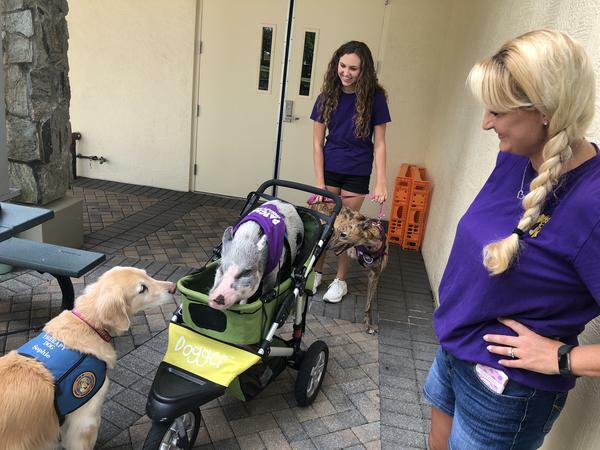 The mayor of Parkland organized the weekly meetup, where Douglas students and their families could come to the city's recreation center in Pine Trails Park and spend time with the dogs and their owners. "This is where William is most comfortable," Lisa Olson told me. She brought him and his younger sister, Elizabeth, to the event. The siblings smiled and laughed as they floated around the room visiting with each dog and even one pig. They later helped Beaudin take her golden retriever, Sammy, for a walk. 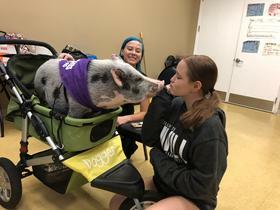 At one point, Lisa settled down next to Patches, a 50-pound teacup pig who loves Cheerios and rides in a dog stroller. Petting Patches, Lisa commented that his gray fur didn't feel like she expected it to — it's wiry, bristly. But there's a soft spot behind his ears. "You need a little sunblock. You're so pink," she told Patches. He answered with a loud oink. Lisa then asked Patches' owner, Tiffany Aaron, if she paints his nails. "I don't paint them, but I do clip them," Aaron said. "He gets little 'hoovicures.'" At one point, Patches' girlfriend came over for a visit. Reagan Licata is 14, a new freshman at Douglas. She met the pig four weeks prior, kissed him right on the snout and announced he would be her date to the homecoming dance. "I'm probably going to get him a bow tie," she said. "I think my dad's just happy it's a pig" — and not a boy — she said, laughing. Aaron assured Patches will "keep his hooves to himself" at the dance. Patches snorted, and Reagan responded with high-pitched giggles. "That was perfect, dude," she said. Nearby, Aaron's 15-year-old daughter, Emily, was sitting on the floor with her three-legged brindle greyhound, Lulu. Emily decided to train Lulu to be a therapy dog because the teen thought her story would be inspiring to people going through hard times. Lulu lost one of her legs in a racing accident before Emily adopted her. Lulu is able to walk, but sitting or laying down by herself is tough, so Emily helped set her down on the floor in a position that's comfortable. "As horrible as an event took place in her life, she has been thriving … and growing stronger as a dog every day," Emily said. 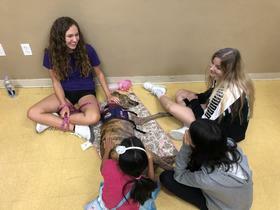 Two sisters — Alexa and Kiran Goel — sit cross-legged around Lulu, who is sprawled out on the floor at Therapy Dog Thursday with her head resting on another student's sneaker. Kiran is 9, and her big sister, Alexa, is 15, a sophomore at Douglas. 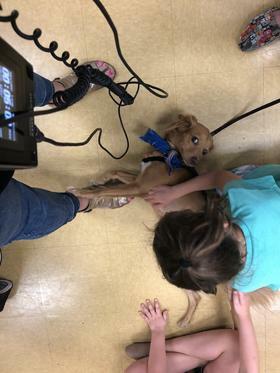 The girls' parents recently got them a puppy, because they saw how helpful the therapy dogs were for Alexa when she returned to school after the shooting. "It helped me keep going back to school because I had something to look forward to," Alexa said. 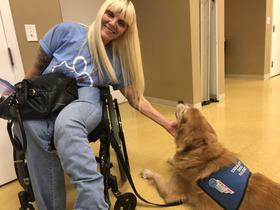 Donna Levy was at the weekly event with her 9-year-old golden retriever, Sophie — she's the one William said will do anything for food. Levy is a Parkland resident and the mom of two Douglas graduates now in their 20s. She said it was surreal to see the school after the shooting, when she went with Sophie to volunteer. "It didn't feel like a school to me," Levy said. "There was police all over. It was eerily quiet. There were all these reminders of what had happened, and it was unsettling." 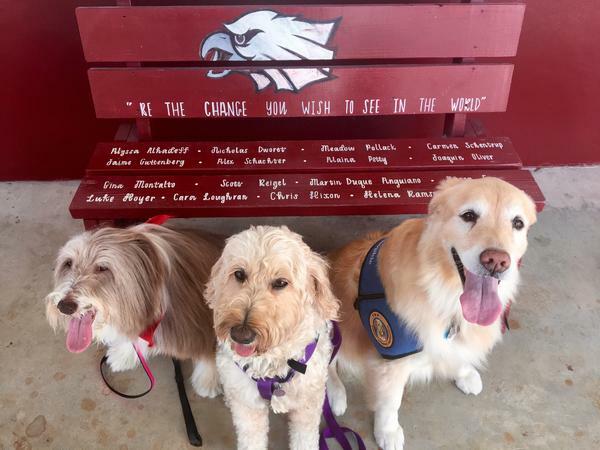 But she said Sophie and the other therapy dogs allowed students to be "totally in the moment" rather than dwelling on what happened in the past. Dogs give them something to focus on other than the tragedy. "For some kids, it's just a happy-go-lucky dog looking at you like, 'I love you! What are we gonna do fun?'" Levy said. "And you can feel your endorphins going off." 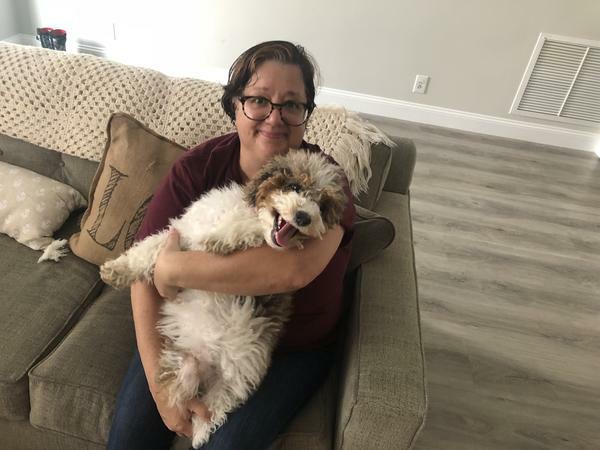 Going to Douglas was especially rewarding for Melinda Steinbacher when the kids started looking for her dog, Emma, specifically and commenting that they had missed her when she wasn't there. Steinbacher calls Emma a "mystery dog" — she's not sure about her breed or her age. The small, rust-colored dog with fluffy ears and a patch of white fur on her chest was abandoned in a box at a shopping mall in Puerto Rico before being rescued and brought to the mainland. When I met Emma at Therapy Dog Thursday, a weekly event held at the rec center in Pine Trails Park over the summer, she was wearing a patriotic-themed scarf around her neck. She lay at my feet and placed her paws on my ankle as two little girls sat on the floor, petting her. "It brings them out of their dark spot," Steinbacher said of the dogs' effect on student survivors of the shooting. "It can make them happy when they feel like the world around them is collapsing." Mary Cullinan has been struck by how her dog, Fergie, can recognize when a person needs her help. Cullinan would get called to a classroom to help a struggling student who lost a sibling or close friend in the shooting, and her 7-and-a-half-year-old labradoodle would walk right up to that student without being directed toward him or her. The second day the two volunteered at Douglas, the principal asked teachers to come to the auditorium so he could speak to them. When Cullinan and Fergie got to the auditorium, Fergie stopped right inside the door. There was a teacher sitting there, on the floor, because she couldn't go any farther into the room. Fergie put her head in the teacher's lap, and the teacher began petting her. So Cullinan sat down there, too. Eventually, the teacher was able to get up and sit in the theater seating. "Fergie knew she needed her," Cullinan said. "We spent our first week in her classroom." When Diana Haneski first met her new bernedoodle puppy, River, she scooped her up and the dog licked her face. Haneski, the library media specialist at Douglas, thought: "She's love. That's what she is, a bundle of love. And that's what we need." Haneski has a busy job presiding over the library at a high-achieving high school with more than 3,000 students. 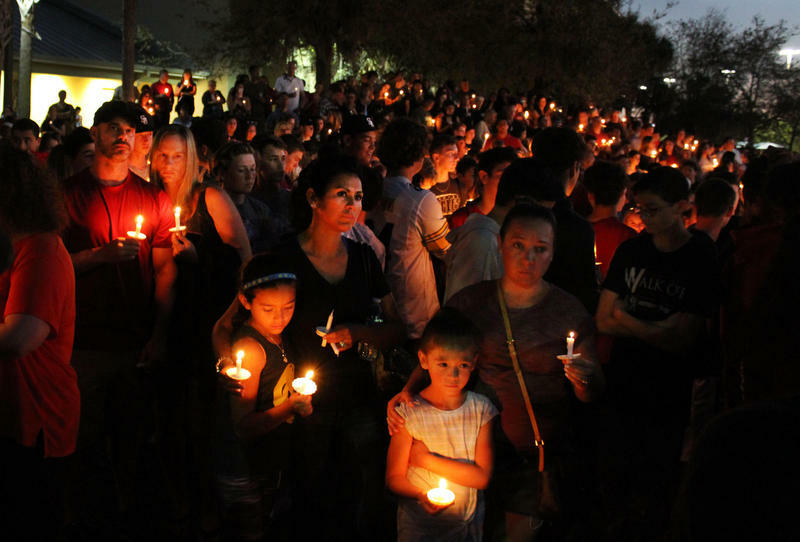 Last school year, it was even busier because the library was home base for the counselors and teachers and volunteers who streamed into Douglas after the shooting. 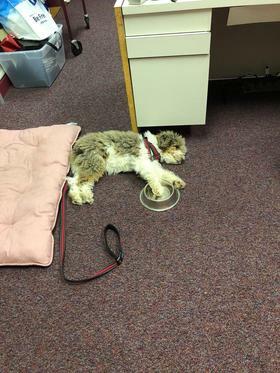 A breeder in Idaho donated the dog to Haneski, who agreed to take her in and help train her as a therapy dog. 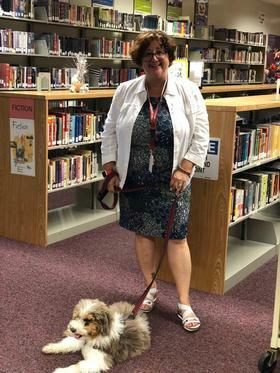 She's bringing River to school every day, where she'll stay in the library for students or teachers who need her help. Haneski has been reflecting on the name she and her husband chose for their new puppy. It fits, for one, because River loves water. When I visited Haneski in her Margate home over the summer, she had just given River another bowl of the water, and the dog put her paws in the bowl and splashed it around the room. Another reason: "When you actually think of a river — flowing, ever-changing, passing through — I think it's a good name because we are changing and dealing with what's passing through," she said. "A river makes rocks smooth and beautiful, and so it's hopeful to me." 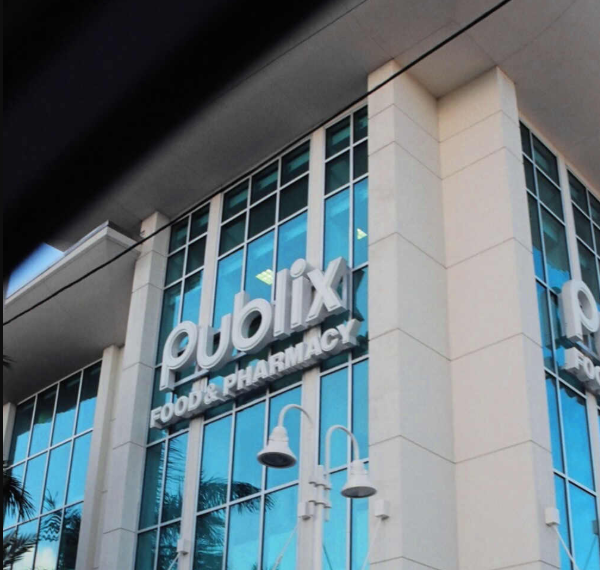 But her husband's original idea for the name came from a book about the Everglades called "River of Grass." It's the seminal work of the pioneer environmental activist: Marjory Stoneman Douglas.